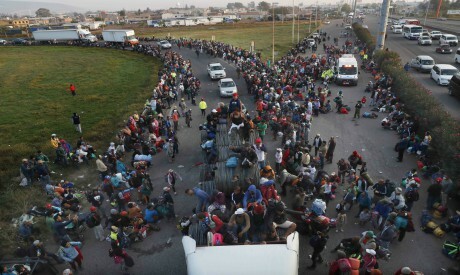 Several thousand Central American migrants marked a month on the road Monday as they hitched rides to the western Mexico city of Guadalajara and toward the US border. "Sometimes we go along laughing, sometimes crying, but we keep on going,'' she said. "Now the route is less complicated,'' Martinez said. "I can't bend it,'' Caray said, as he watched other migrants swarm aboard tractor-trailers. The caravan became a campaign issue in US midterm elections and US President Donald Trump has ordered the deployment of over 5,000 military troops to the border to fend off the migrants. Trump has insinuated without proof that there are criminals or even terrorists in the group.